The human mind is a beautiful thing. Our ability to perceive, manage and express our individual experiences has been a huge reason for our success as a species. However, let’s not get too narcissistic. As rational as we like to think we are, our brain is riddled with ingrained patterns of thought which can lead us to be very irrational. Cognitive scientists and psychologists call these blips "cognitive biases." Simply put, cognitive biases are mistakes made by the brain when reasoning, evaluating or other cognitive processes. They are usually caused by an association with previous emotional memories. We experience and perform these deviations on a daily basis, even if we are utterly unaware of it. In fact, in the business, political and marketing worlds, these little shortcomings of the brain are regularly used and abused against you. 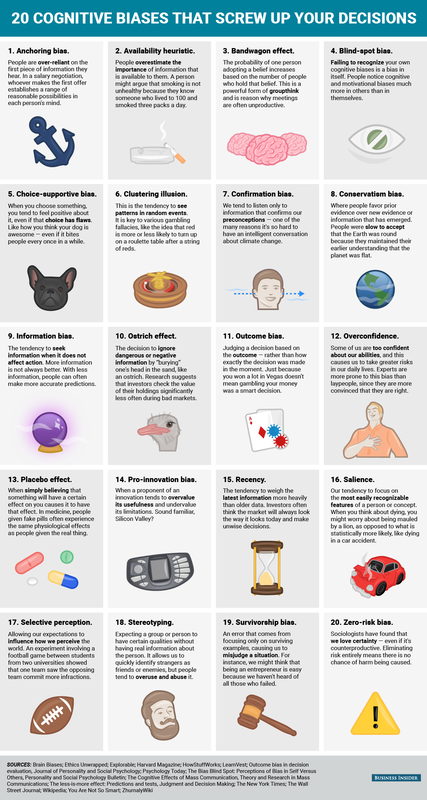 This neat infographic from Business Insider, created by graphic designer Samantha Lee and reporter Shana Lebowitz, shows 20 of these cognitive biases that make us realize how irrational and malleable our little meat-bag brains can be.